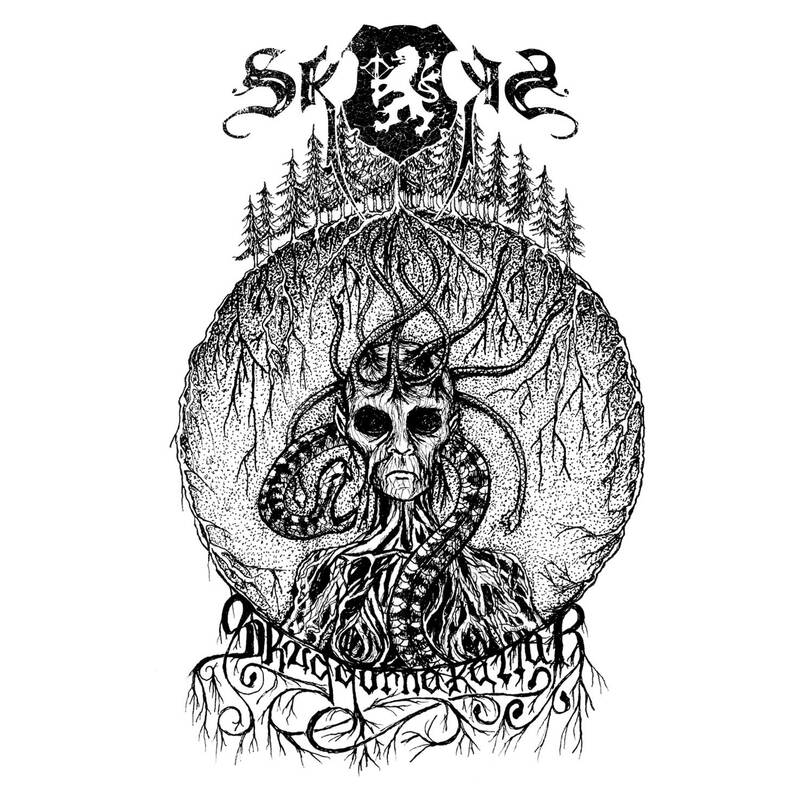 Skogen (in English: Forest) is a Swedish Black Metal band that has recently released their fifth full-length entitled Skuggorna Kallar (in English: The Shadows Call). The album is a most welcome offering of a uniquely adventurous blend of Atmospheric Black Metal and Folk Metal. Contained within are eight songs which combine to give a uniformly pensive, introspective feeling. With each listen, one is met with new ideas, feelings, and melodies which serve to expand the overall effect of the album. Surely, this is material written from a deeply personal well of creativity that serves to advance the genre with the atmosphere delivered. Opening the album is “Det Nordiska Mörket,” a track that suddenly arrives and thrusts the listener deeply under the spell of Skogen. It is a mid-paced affair that begins with clean vocals and a mournful riff, pulsing with Nordic atmosphere. Atmosphere is the key word for this album. When the Black Metal vocals arrive, it is striking and followed by some powerful synths lending their unique color to the pallet. The following track titled “När Solen Bleknar Bort” contains a passage in the middle focused on an aggressive bass line that, while short, stands out in the middle and is followed by a short, melodic solo. “Frostland,” the fifth track utilizes acoustic alongside heavy, distorted riffs giving an inventive shade to the tone. The interlude is especially of interest with its gorgeous elaborated melody and brief solo. Perhaps the most striking song on the album is the sixth track, “The Suns Blood.” It was upon hearing this track that the realization came that this album largely echoes the sound and feel of Ulver‘s monumental debut, Bergtatt. It is pure magic, and the vocals actually sound like those of Garm at one point. One can definitely hear other bands that influenced Skogen, but on this track, in particular, Ulver resounds the clearest. Skogen is very much a band made up of many unique elements: a thick, clear guitar tone, acoustic guitar, plodding bass, alternating clean and harsh vocals, melodic leads, and a genuine love of Bathory, particularly the Hammerheart era being represented. The general sound of the album is large and quite washy with swathing amounts of reverb. The drums are largely utilitarian and lack any blasting as a mid-pace is maintained throughout. The guitar tone is giant and organic, not over-saturated and aided by a judicious amount of acoustic guitar. The leads, as above chronicled, are generally short affairs, but offer their own melodic voice contributing to the whole. Another point of reference for this album would be early Borknagar, particularly The Olden Domain and the way tracks like “The Dawn of the End” consume the listener, transporting one to another plane entirely, an aural astral displacement in effect. One is struck with images of ancestors in an ancient Europe, the expanse of the stars in the night sky, the golden gods looking down upon us all, and what those ancient people must have thought long ago gazing up at those heavenly bodies. Images of dense, verdant forests, lonely isolated mountains, and still lakes filled with crystal clear, clean water are conjured. There is also a cold, violent undercurrent in the material perhaps aimed at the destruction of the attractive earth, the most inspiring beauty indeed. Skuggorna Kallar is clearly a mood record as it evokes certain feelings in the listener from the combined effect of the infectious melodies and motifs within the tracks. Regardless of the circumstance, it is a fitting soundtrack to life for the musicians have truly bared their collective souls to create a succinct definition of their most abstract of feelings and ideas.